Touring internationally since 2008, more than 600 pianos have now been installed in 26 cities across the globe, from New York to Sydney and now Salt Lake City, bearing the simple invitation ‘Play Me, I’m Yours.’ The project has reached more than two million people worldwide, with each new city that commissions the work becoming part of a growing legacy. 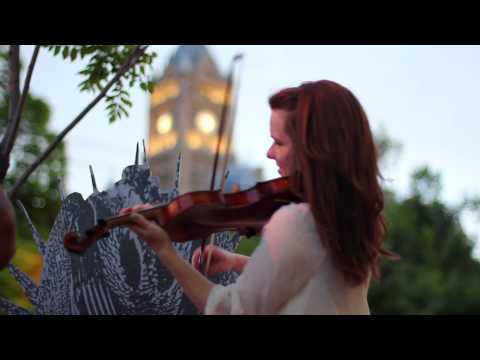 In June 2012 Utah Museum of Contemporary Art presented Play Me, I’m Yours by British artist Luke Jerram. 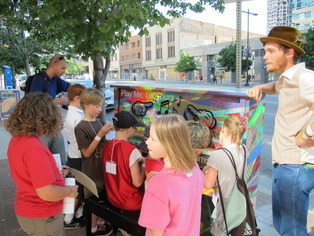 10 pianos were placed onto the sidewalks of downtown Salt Lake City from 14-30 June for the public to play. Painted by local contemporary artists the pianos were one-of-a-kind works of art distinctive to the region. From professional musicians, rank amateurs, and the musically untrained of every age, all were invited to sit down and play these wonderful pianos in the public spaces of downtown Salt Lake City for two brief weeks. The University of Utah will host three of the “Play Me, I’m Yours” pianos from last summer’s downtown Salt Lake exhibition from September 4 2013 – for more information visit Salt Lake Tribune. This website was made for the public to post and view films, photos, and comments. The 5 Browns playing an arrangement and rift of Mozart's Alla Turca by Greg Anderson. The video was filmed while playing the international street pianos art installment by Luke Jerram, called "Play Me, I'm Yours." Location: Gallivan Center, 239 S. Main St. Location: Celtic Bank, 268 S. State St.
TLC Trio does a cover of U2's Pride (In the Name of Love) using the "Play Me I'm Yours" Street Pianos in Salt Lake City in June of 2012. For more information, visit http://www.tlctrio.com. Amazing!! This was a great experience, I loved how it was painted, it does work, and feel great to have it right there on the street. I was at SLC working, but walking around and found something like this was very cool! !.